....who had 2 daughters..... one of which became my mother. 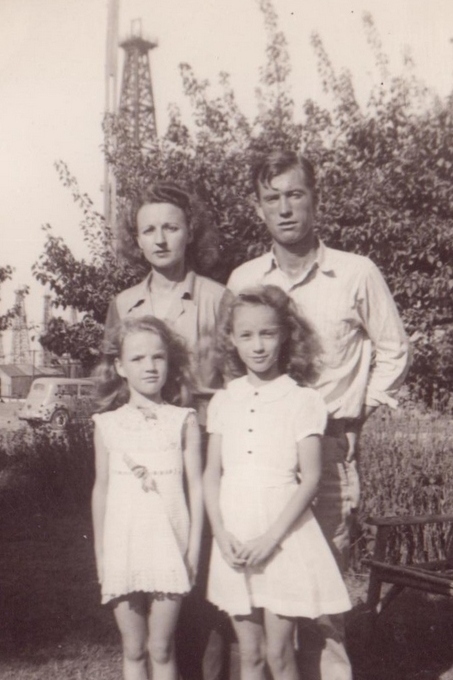 The photo below is probably dated around 1943 and shows one of my grandfather's oil rigs in the background of the family picture. I believe he was a 'wildcatter'. My mother is front, right, when she was about 10 years old. My grandmother, Opal, had a younger sister named Juanita. 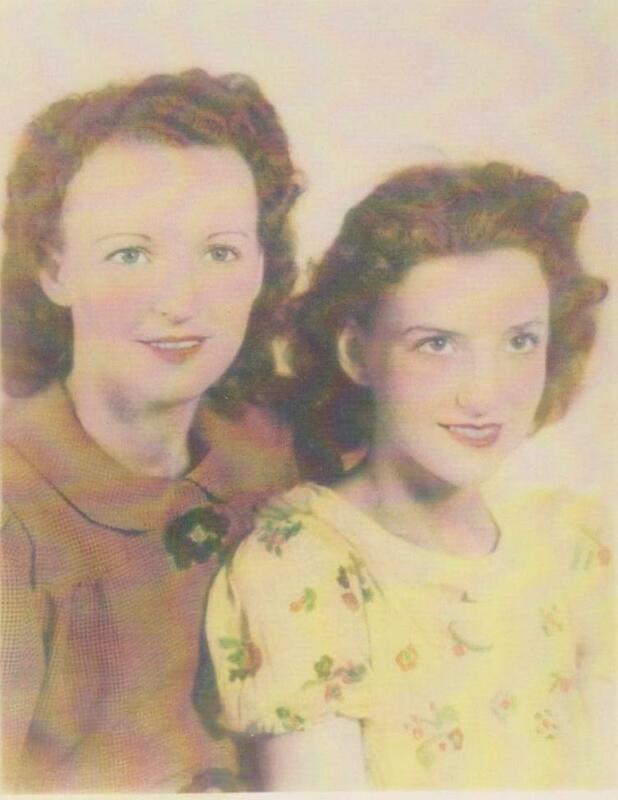 Opal, my grandmother, to the left in the photo below, Juanita to the right. Juanita grew up to be the mother to my cousins Dorothy and Clifford. Clifford was close to my age and he and I would play together and his kindness, generosity, and unselfishness towards me when we'd visit out there are a big part of my childhood memories. I am sure you are wondering what all this family history has to do with a sewing blog! Well, a quilt always has a story to tell and I've decided my 3rd quilt will be for Clifford, who still lives in Oklahoma. I wanted his quilt to have some sort of connection to Oklahoma and was thrilled to find the 'Road to Oklahoma' quilt block. 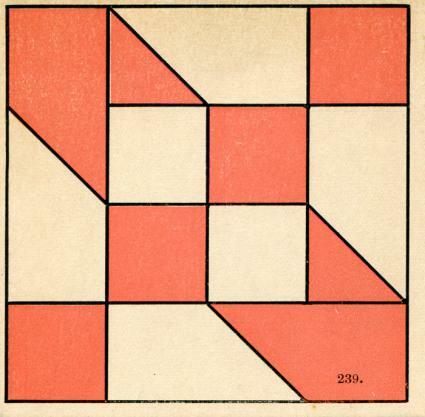 The photo below, is from The Quilt Index, showing this block dates to 1895 and was created by The Ladies Art Company. There's more historical information on this block at the link. 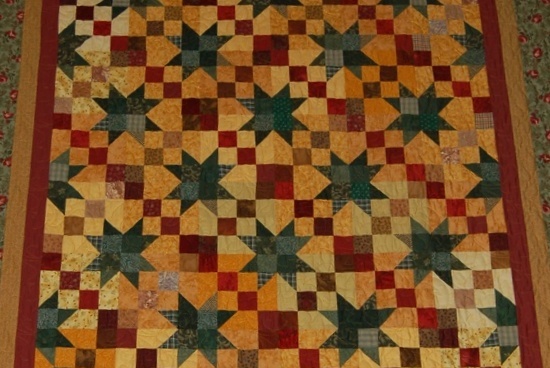 Having decided upon the quilt block, I looked at dozens of Road to Oklahoma quilts to get an idea of how to pull mine together. 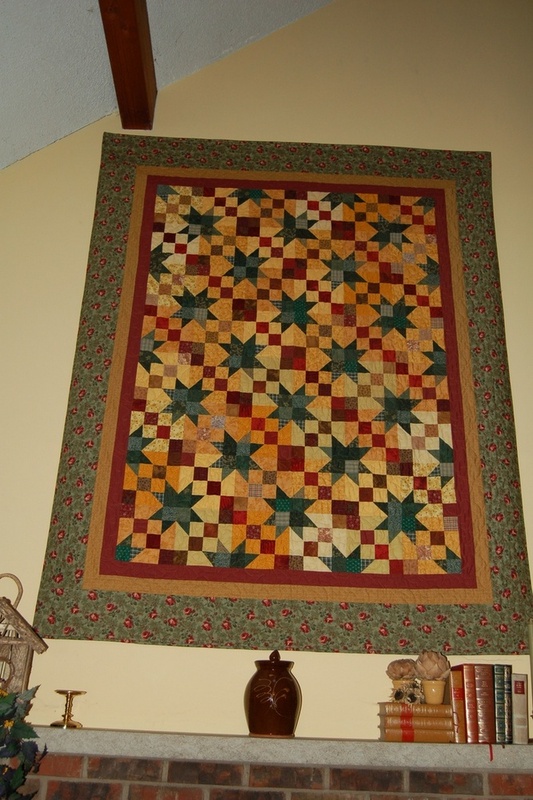 When I saw Karen's gorgeous Road to Oklahoma quilt, photo below, I immediately knew THAT would be the one. I've had the great good fortune to 'meet' Karen through Pinterest and she graciously allowed me to share her photo of her quilt with you. I love her quilt so much, I downloaded the photo into my iPad and have studied it time and time again. I've cropped and enlarged a section here, below, to show you the muted colors of the background blocks. Each block has a different background color palette.... love it. My quilt will be done using 2 1/2" blocks and this video by The Gourmet Quilter, below, was very helpful. .... and I'm thinking this will be the quilt back. He likes deer.... a lot. One block complete..... 47 more to go! Each finished block measures 8", so by the time I add the border/sashing, it should be @56"x72" - perfect for a quilt for his sofa. Another block ready to be pulled together. At this point I was still figuring out what fabrics to use where. I'm trying to use different, but complementary, background colors in tans, golds and beiges like Karen's quilt. Each star will be green and the middle squares will be the scrappy browns. 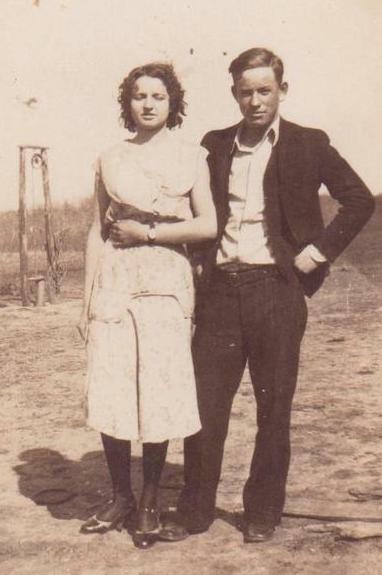 And if you are interested in the rest of my grandparent's story...... my grandfather worked very hard building an oil business and when he was in his early 50's, enough oil had just come in to pay off all his equipment debt that amounted to over $100,000 - a lot of money in those days. Thinking he was on the way, finally, to the 'good life', an oil rig accident left him paralyzed and dependent on my grandmother's care for the rest of his life. His oil company faded away as my grandmother made ends meet by sewing for clients out of their home. She cared for him for over 25 years and never once ever complained. She passed away only a few short years after he died. 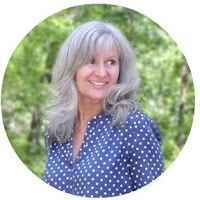 I sure hope Clifford doesn't read this blog! as his quilt is a surprise I hope to be able to give to him, in person, on our ( tentatively-planned) upcoming trip to Oklahoma next month as we travel the Road to Oklahoma. Oh, Lisa, what a special, special quilt that is going to be! Wonderful fabrics you picked out for your cousin, Clifford. This is what I love so much about the old traditional quilt blocks . . . looking at the individual block, you would never guess it could be put together with other blocks of the same design to form that beautiful over-all pattern. Can hardly wait to see the finished quilt! Thank you so much for your words of encouragement! Your quilts are always a source of inspiration, so I treasure your opinion. What you mentioned about the humble quilt block, is so true.... until you put at least 4 of them together, you'd never know they'd form such a beautiful design. P.S. You are not getting forgetful in old age - I made two striped dresses, in two different colours, and there were two posts !! I'm finding quilting to be enjoyable not only from the technical putting-it-together aspect, but also from the historical connections.